Decorative Marbled paper address book with elastic . Hand bounded Florentine style - cm 8 x cm 6.
notebook watermarked (Filigrana) paper Amatruda 320 gm, pages 18. Hand bounded . - cm 9 x 13.
marbled paper made by a process unique in the world. 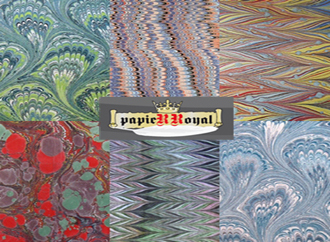 All patterns are registred and any reproduction even partial is prohibited. Small differences of shades can occur from one serie to another, mostly due to the handmade reproduction process. Expedited priority cardboard tube from Italy. Papers will be shipped rolled in a cardboard safe tube.